On a dark and gloomy rain-filled day, a shroud of secrecy permeated the air on the Bremerton waterfront. It was the perfect setting for the final day in the top-secret career of the Bangor-based USS Parche, one of the world's most prolific spy submarines. 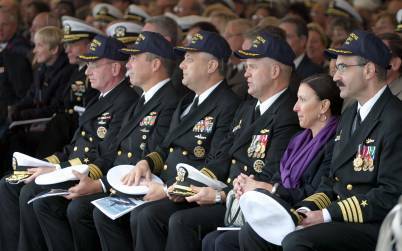 By the time its life ended Tuesday in a decommissioning ceremony at the Bremerton naval base, the Parche was the most highly decorated ship in Navy history - even though most Americans have never heard of it. Commissioned in 1974, the Parche spent 30 years and 19 deployments as America's top espionage sub, reportedly tapping the undersea military communication lines of the Soviet Union during the Cold War, plucking lost Soviet weaponry from the ocean floor and gathering intelligence on other enemies afterward. 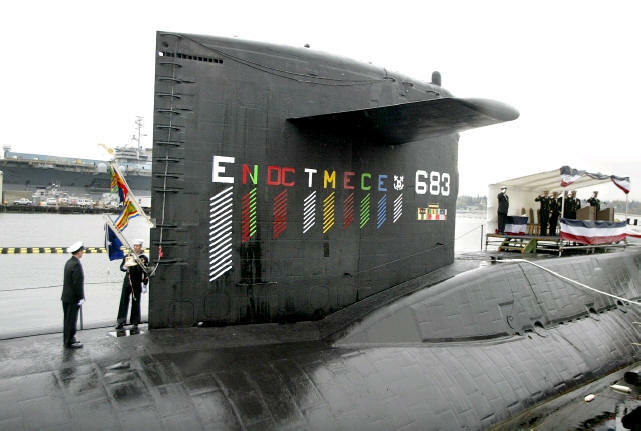 The Parche (pronounced PAR-chee) was officially designated by the Navy as a "research and development" submarine. And it did plenty of that, testing new sonar and undersea warfare technologies. But its highly classified missions, none of which have ever been officially confirmed, are the most intriguing aspect of its history. Many of those missions were deemed to be of "vital importance to U.S. national security," earning the submarine an unprecedented nine Presidential Unit Citations. The vast majority of ships never receive even one. For being the most decorated ship ever, shouldn't more people be made aware of what it accomplished? "Those that need to know, know," said a matter-of-fact Rear Adm. Ben Wachendorf, who commanded the Parche from 1988 to 1993. Wachendorf, now U.S. defense attaché in Moscow, traveled from Russia to be at Tuesday's ceremony. "I wouldn't have missed it for anything," he said. "It means a lot to be able to say goodbye to an old friend." In fact, all but one of the Parche's nine former commanders were present at the Parche's decommissioning. 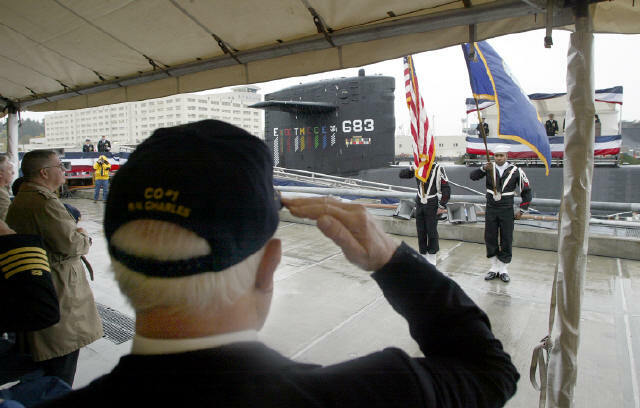 In addition, about 130 former crew members, most belonging to the USS Parche Association, were on hand to witness the sub's inactivation. Those who returned to see their sub one last time said it was not only the camaraderie of submarine life that made Parche special, but also the exotic and extremely challenging missions it completed, which often involved excruciatingly long periods spent submerged with dwindling food and supplies. "It's the end of the life cycle," said Manchester resident Will Longman, chairman of the Parche Association. "It's very meaningful. The camaraderie does not go away. And the uniqueness of Parche imparts its own special camaraderie." The Parche also was the last of the Navy's 37 Sturgeon-class fast attack subs to be deactivated - though it barely resembled any of the otherr ships of that class. Th at's because its hull was extended by 100 feet to accommodate extensive classified modifications in a four-year stay at Mare Island Naval Shipyard near San Francisco in the late 1980s and early 1990s. In 1994, the Parche and its crew of 190 moved from Mare Island to Bangor. It had already earned six Presidential Unit Citations by that time and earned another three after its transfer to Bangor, including a ninth for its final deployment that ended in late September. The Parche's final resume also included 13 Navy Expeditionary Medals and 10 Navy Unit Commendations - all unprecedented numbers. "Parche has had a career unmatched in the annals of submarine history," said Rear Adm. Paul Sullivan, commander of the Pacific Fleet submar ine force. "Parche has gathered enough citations that are just truly remarkable ... based on her superb performance in critical national tasking. "She now ranks among the most legendary vessels to ever have sailed under our flag." Sullivan compared the Parche's storied past to other historic Navy vessels, such USS Constitution, USS Monitor, USS Missouri and USS Nautilus. "And now there is Parche," he said. The ship figured prominently in "Blind Man's Bluff: The Untold Story of American Submarine Espionage," a nonfiction book published in the 1990s, which described how it spent its Cold War days spying on the Soviet Union. It's also been reported the sub, with a claw-like device, was able to pi ck up lost Soviet missiles or bombs from the sea floor. Later, it reportedly deployed unmanned drones to complete many of the espionage tactics. Following the Cold War, the Parche continued its highly classified missions, with many observers citing an even higher sense of secrecy. It's said the Parche spent plenty of time in the Persian Gulf, gleaning intelligence on Iraq and Iran, and traveled through the Western Pacific keeping tabs on China and North Korea. Capt. Richard Charles, the Parche's first commander, traveled from Mobile, Ala., for Tuesday's ceremony. He took command while the sub was being built and went on its first deployment, a five-month journey in the Mediterranean Sea. After that, the sub transferred to the West Coast and began its spy missions a few years later. "Those guys in the Pacific had all the fun," Charles joked. "I just built it." "It's always sad to see a ship retire, but after a while, they are like you and me; they wear out." Ironically, the name of the Parche's last at-sea commander, Capt. Charles Richard, was a mirror image of the sub's first. Richard was relieved in a change-of-command ceremony Tuesday after leading the Parche on two post-September 11th deployments, including one that lasted 122 days in 2002. "Being commander of this ship was an extraordinary experience and I was fortunate to be given the experience," he said. "I hope that each man who has served aboard this ship will look back and swell with pride kn owing that he answered his country's call." Following the ceremony, the Parche, probably one of the least known subs to the general public because of its highly classified missions, silently shifted over to Puget Sound Naval Shipyard. There, it will be torn apart and recycled over the next few years. And it's probably the first time in the Parche's history that its whereabouts will be known. "That just proves our success that nobody knows what we do," said Bremerton resident Curt Mathews, who retired off the Parche last year. "It's kind of fun. People say, 'The Parche? I never heard of it?' Well, that's good.